Infant Baptisms are normally scheduled for the 11:15 Mass on Sundays. The next Baptism will be on February 24th. There will be no Baptisms on Sunday during Lent. The next Sunday Baptism will be on Easter Sunday, April 21st at the 11:15 Mass. There will be no Baptisms on April 28th. The regular schedule will begin again on Sunday, May 26th. If your family is unable to attend on these dates, we will try to accommodate another, non-Sunday, date. A required Parent Class is held on the 2nd Sunday of each month. Please contact Fr Smith as soon as possible. A destination wedding still requires the Parish to collect the documents and provide the instruction. Again for this coming Lent, St. Charles is organizing small groups of individuals who would like to participate in prayer, reading and reflection on scripture, and discussion of our faith, in preparation for Easter. Past participants will tell you it is a great experience! Sessions meet weekly starting after Ash Wednesday (March 6) and concluding before Holy Thursday (April 17). They last about an hour and there is no need to attend every session. One group will meet Sundays at 8 am –you can join that group, or we’ll schedule groups for any other time there is demand! If interested, please sign up on the sheets in the back of the church, or contact Jane Olson ([email protected]) or contact the rectory. Last weekend, in addition to the canned food donated at the back of the church, we collected $2,050.00 to help replenish the Catholic Charities’ Food Pantries. On behalf of Msgr. LoPinto, we are truly grateful for your contributions. Let us pray that people will come to their senses and this will never be necessary again. Meet & Greets after each Mass this Sunday, January 27 – coffee and breakfast after 9 am and 11:15 am Masses; wine and cheese after 7 pm Mass. 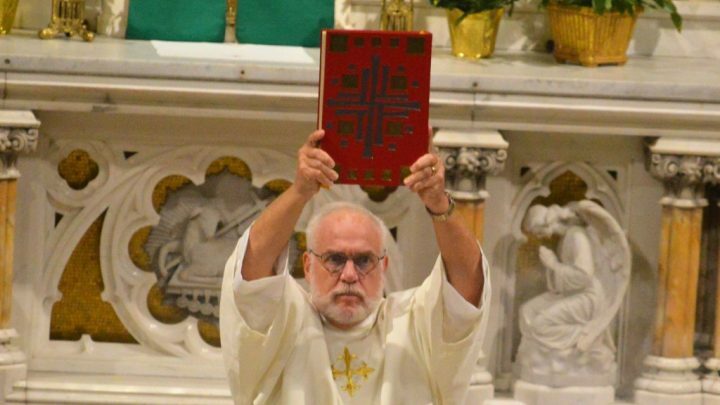 Bishop’s Visit – Bishop DiMarzio will be celebrating the 9 am Mass next Sunday, February 3. Please come to welcome him to our parish. Many times in the last few months we have read from the prophets who accompanied the Jews returning to Jerusalem after the exile in Babylon. Today we will read from Nehemiah, a Jewish layman who was governor of Jerusalem around 425 BC. Although not a historian in our sense of the word, he does provide a wider context than the prophets. Also, as an administrator, he provides another perspective. He is usually and correctly linked with Ezra. Ezra was a priest who reestablished worship, and as we will see today reemphasized the power and meaning of the Law. Ezra would have begun his work In Jerusalem around 450 BC but he is usually depicted as working with Nehemiah. The section we read today is narrated by Nehemiah, but speaks of the activities of Ezra. The seventh month is not chosen accidentally. It is a time of festivals: the “Day of Atonement” and “Feast of Booths”. The feast of Booths celebrates the first Exodus in which the Jews were freed and given the law to sustain and guide then. The Jews have again experienced an Exodus and will again receive the law. First, we have seen it before. King Josiah in the time of Jeremiah (622 BC) “found” a copy of the Law when renovating the temple which had been lost to the people and called them together to read it to them. (2 Kings) Ezra is seen indeed as the new Moses and he or his disciples provided the final revisions of the Torah – or Pentateuch, the first five books of the Bible – and the historical books such as Kings. Also, people who have attended Synagogue services will see great similarities to the synagogue services of today. Ezra stood on a raised platform with community leaders on either side, opened the Torah and interpreted it for them. Please note that we do not know when synagogue services began, but the Law as the means by which the People are maintained is a legacy of the exile when they did not have temple worship. Although they now have the temple again, they recognize that most Jews will be unable to participate in its worship and that emphasis needs to be placed in local communities. This becomes more important when the priests of the temple are found to be so corrupt that even if the sacrifice offered there is valid, it is less and less satisfying. The reading of the Law was not without effect. We must remember that there was much grumbling among the people about the difficult conditions. This of course is reflected in the discontent of the ancestors as they left Egypt and in the desert “yearned for its fleshpots”. The immediate reaction to the reading of the Law was recognition and remorse. Thus, the importance of both Nehemiah, the “civil” authority, and Ezra, the “religious”, assuring the people that God is forgiving and that they should receive the Law with joy and celebrate it, not with sack cloth and ashes, but with a feast. This is key, but Nehemiah has more to teach us. After he established security and assisted Ezra in a religious revival, he returned to Persia. Those whom he placed in positions of importance were not able to lead the people and they became lax in observing the Law. Their faults included working on the sabbath, insufficient care of the temple and the unjust withholding of wages from the temple workers. Upon his return, Nehemiah addressed these failings quickly and efficiently. This reminds us of some issues about reform. Reform begins when people realize that the previous ways of doing things no longer work. This can be for many reasons, but the recognition of malfunction is always the same. It can also be addressed in many ways, but however sincere the intention, the work is not completed until it has been institutionalized. The boring details of who reports to whom, how long does someone serve and the countless other items of procedure and administration are critical for success. Even then reform requires constant vigilance and commitment. We see this all around us. Our system of government requires people to enter public service. This is ironic at best to say when many who supply key services for us have been asked to work without pay. This is a frightening example of institutional failure. Let us look at the church. My generation grew up with Second Vatican Council. We were filled with hope and expectation of miraculous change. But many of us did not take law and the simple running of the machine seriously. It didn’t seem important until 2002 when we realized that we did not have an institutional response to clerical abuse. The Jews returned to Jerusalem with great prophets, but they would not have succeeded without committed administrators. Neither will we.